He may head of one of the world's elite superpowers, but to his fellow judo club members Russian President Vladimir Putin is best known for his wicked sweeping leg throw (Haraigoshi). Although it is little known in the west, Putin is an avid student of judo -- the Japanese art in which students compete to throw their opponents or defeat them on the ground with grappling techniques, such as immobilizations, chokes and submission arm locks. 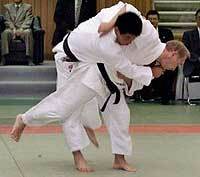 Putin began studying judo at age 14 and has been studying ever since. During his competitive career, among his many victories Putin placed third place in the Russian Junior Nationals and was Leningrad Seniors Champion. He is now President of the same club where he began, St. Petersburg's Yawara Judo Club. This last September 5th, following an official state visit to Tokyo, Japan, Putin was a guest at the famous Kodokan headquarters of judo. In attendance were many officials including Japanese Prime Minister Mori. Yukimitsu Kano, the grandson of Kodokan Judo's founder Jigoro Kano said, "President Putin started Judo when he was very young, and has continued practice until now. He had a wish to visit the Kodokan institute. We are very happy to have him and welcome him as a judo member." Following demonstrations of the art, Putin showed his own skills of throwing and grappling. Assisted by a Kodokan instructor, Mukai, Putin demonstrated a variety of leg sweeps, shoulder, and backward sacrificing throws plus two techniques favored by smaller men facing larger opponents -- an inner leg throw that dumps the opponent backward and the basic hip throw that introduces most students to the art. He also performed dround immobilization techniques. Afterwards Putin's assistant, Mukai said, said that President Putin's technique was very good. Putin was then presented with flowers by a young lady. And to the delight of the audience Putin permitted her to throw him. He was officially awarded a coveted sixth degree black belt. 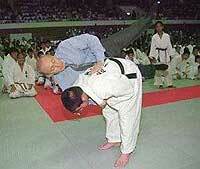 Not since US President Teddy Roosevelt has a world leader been associated with judo or other martial arts. Roosevelt had been involved in both boxing and wrestling. After witnessing a demonstration of judo by Yoshiaka Yamashita against a wrestler at the White House, Roosevelt began studying the art under this teacher, eventually becoming the first American to achieve the rank of brown belt. While Roosevelt may be the first modern day head of state to actively practice in the martial arts, Putin is certainly the first to achieve an advanced rank in martial arts. Tom Ross is a retired NYC Correction Officer who specialized in the Handling of Security Risk group prisoners. A Yudansha in Shorinjiryu Kenzenkai Karatedo (an Offshoot of the Shorinjiryu Kenkokan founded by Masayoshi Hisataka), he also spent six years studying Jujutsu (classical, modern and Brazilian). Possessing an avid interest in the history of martial arts and traditions he currently serves as the Research Coordinator for FightingArts.com as well as moderating its Martial Arts Talk forum. He additionally serves as the moderator of the Sabaki List (which is dedicated to various martial artists and full contact stylists) and is a member of the International Hoplology Society.